Recently Queen Elizabeth II honored the Yeoman of the Guard upon the anniversary of the death of King Henry VII, founder of the Tudor dynasty, who founded the guard at the battle of Bosworth Field wherein he defeated King Richard III of the House of York, ending the Wars of the Roses in 1485. Their official title is "The Queen's Body Guard of the Yeoman of the Guard" and are considered the oldest military corps in Great Britain. They would be one of the contenders for the oldest overall but as they are a purely ceremonial and honorary body they must take second place to the Papal Swiss Guard which is still an active military force that is charged with actually protecting the Pope. The Yeoman of the Guard these days are made up of retired military personnel from the Army, Marines and Air Force (66 officers and men). 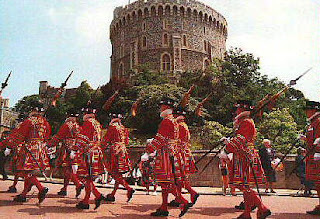 The Yeoman of the Guard take part in many ceremonial functions involving the British monarch such as the Royal Maundy Service, the Royal Garden Parties and they have also searched the cellars of Parliament before each state opening ever since the famous "Gunpowder Plot" of November 5, 1605. In the past, when the Guard was an actual military unit they saw action in many of the most famous battles in British history such as the Battle of the Boyne in Ireland and the battle of Dettingen in 1743 in which King George II became the last reigning British monarch to lead troops on the battlefield. Today the Yeoman of the Guard is made up of former British non-commissioned officers from the rank of sergeant and up between the ages of 42 and 55. They serve at about 30 events per year. The Deputy Chief Whip of the House of Lords is always their commander and new Yeoman are chosen by the monarch on the recommendation of the Lord Chamberlain. They are compensated for expenses but do not draw a salary.